Songwriters in Seattle is proud to announce an exciting partnership with Benaroya Hall that will bring the inaugural Northwest Music Experience (NWME) conference and expo into their beautiful downtown venue. 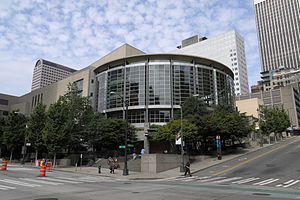 Benaroya Hall is the place to be August 16 – 18, 2013 for this multi-genre music education, expo, and performance event. Highlights include: a keynote address, expo floor, VIP party in the Grand Lobby, closing ceremonies, and featured performances in the S. Mark Taper Foundation Auditorium. WHERE ARE THE WOMEN IN FILM? As the saying goes, “Behind every successful man, there is a woman.” However in the world of film, it appears that behind 2011’s 250 top-grossing films, only a shocking 5% are women directors. This issue sheds light on the much-debated topic about the presence (or rather, lack of) women in film. However, some might argue that women do have a place in Hollywood by citing Kathryn Bigelow’s big win at the Oscars. During the 2009 Oscars, Kathryn Bigelow shook the film industry by winning the award for Best Director, making her the first woman in history to achieve the top honor. Although her win paved the way for women filmmakers around the world, female film creators are still struggling to keep this glimmering flame of hope ablaze especially with the numbers proving otherwise. Yet, setting an example for Hollywood as the future of film, NFFTY is currently made up of 30% female directors. Randy Cohen, vice president of research and policy for Americans for the Arts, a Washington, DC-based nonprofit, recently shared insights from his group’s study of arts trends nationwide. His message to business leaders emphasized the importance of investing in the arts as an industry, rather than treating arts as a luxury during times of prosperity and avoiding arts when the economy struggles. Increasing public and private support by using economic impact studies to leverage investment can help. But not every good idea needs to cost millions of dollars. “The city of Seattle sees itself as a music town, and it has a Music-On-Hold program. When you call a government office and get put on hold, you listen to music by Seattle musicians. They change it every quarter. It’s so popular the mayor does the voice-overs, and they sell the music on a website. Sometimes, it just takes coordination of existing resources,” says Cohen. Since 2005, Northwest Film Forum (NWFF) has been distributing films using its institutional muscle and expertise to shepherd independent works into the marketplace. NWFF will host a low-cost class on November 18 for local filmmakers to learn more about promoting and marketing their films to the largest possible audience. The workshop reviews today’s changing theatrical film exhibition landscape and realistic options to self-distribute successfully. Reykjavik Calling returns to Seattle for a third year of exciting performances by some of the best musicians and bands emerging from Seattle and Iceland. This event of cross cultural musical exploration has struck a chord with Seattleites. In previous years fans have filled the venue to capacity to catch performances from Iceland’s Mugison, Lay Low and Ólöf Arnalds as well as John Roderick, Rachel Flotard and Sean Nelson from Seattle. Fans can once again expect a truly unique night of music, with a new twist. In an effort to explore new ways for these two distinct cultures to collaborate, each headlining band has been paired with a notable author to write lyrics for a song to debut at Reykjavik Calling. Apparat Organ Quartet is collaborating with Seattle author Ryan Boudinot and The Redwood Plan is collaborating with Reykjavik-born poet and novelist Sjón. The cross-cultural creative process between the authors and the bands will undoubtedly result in exciting never-before-heard performances.